If you have not read about the projects we call Escape Room Quests, let me fill you in a little. Escape ROom Quests are escape room missions that involve solving riddles and tasks to find clues to open a locked box. Students work together to find the keywords that lead to the needed information to unlock a lock. In this Escape Room, students have three tasks to complete. Each task gives them clues and they discover a lock code to open a locked box. The box gives them their next task. In the end, they either receive a certificate of completion or the materials and assignment for a STEM Challenge! How fun is that? Let me just tell you, I have students that enjoy these more than anything we do. They love the complexity and the excitement of racing to find the next clue and lock code. 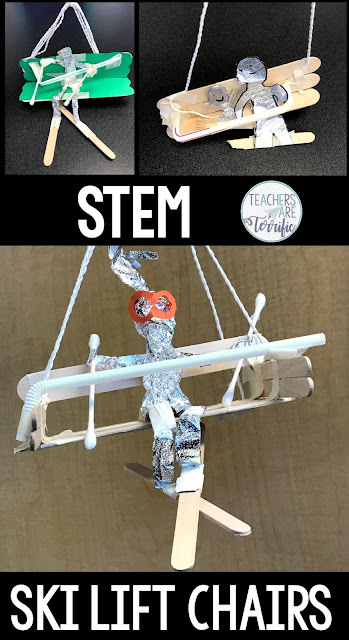 This is the latest STEM Quest! We are calling it the Winter Sports Quest. The first task is a math paper. The clues lead students to a specific ski resort which is displayed on a poster and when they find that poster they will also find the lock code. The second task is a map grid. They place colored objects on the map and follow detailed directions to move the objects all over the world. If they follow the directions exactly one cube will end up near South Korea which will lead students to a poster of a sporting event. And, of course, they will also find the lock code for the second box. The third task is to match images of athletes with descriptions of their sports. If the descriptions are placed in order correctly they will spell out the answer to a question that will lead to the final poster and the final lock code. To make this more challenging there are also two "fake" posters with numbers on them- so students have to really think about the clues and choose the right posters! 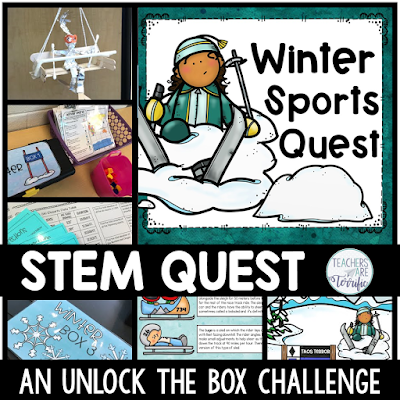 The final box is unlocked and students grab a criteria card for a STEM Challenge! And what a spectacular challenge it is! They design ski lift chairs and the skiers! I mean, seriously, just take a look at the skiers and chairs! The kids had a blast decorating their skiers with goggles and skis and ski poles. 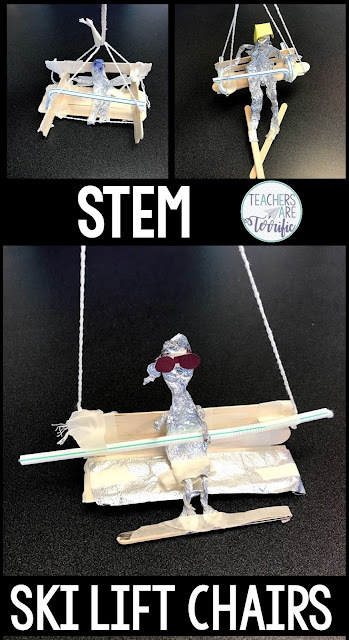 This set of activities took two class sessions-one for the Quest and one for the STEM Challenge. We used math, geography, following directions, collaboration, problem-solving, planning, designing, improving designs, teamwork, and had so much fun! It's a perfect challenge for the winter time!